I haven’t lived in Texas for very long, but I’ve already learned that autumn and winter are the best seasons for working out outside. Exercising outside is wonderful, because it can add a lot of variety and change to our fitness regime. Many people prefer working out outside due to the ever changing landscapes, fresh air, fewer people and a general freedom of being able to be as creative with workouts as one chooses. Exercising outdoors can range from cardio to strength training, or somewhere in between. If you want to add some extra activity to your personal training or gym workouts, then this might be helpful to you! Here are some of my personal favourite types of outdoor activities and workout sites in the B/CS area. First, a public park in any neighbourhood is a great place to start. In Bryan, Hensel park, Tanglewood park, Bryan Regional Athletic Complex,and Lake Bryan park are some of my top places for workouts. In the College Station area, Lick Creek park, Wolf Pen Creek park, Lemon Tree park, and Stephen C. Beachy Central park are great for working out. workouts because it’s the most convenient location for me, but other facilities with a track include A&M Consolidated Public High School, and A&M Consolidated Middle School, both in College Station. Finally, your own back yard is not a bad place to use for exercising, if you don’t mind some possible occasional stares from your neighbours or strangers. So what kind of workouts can be done outside? Running – A steady pace jog/walk is a great cardiovascular workout. Depending on a person’s fitness level the duration of runs will differ. Runner’s World is a good resource of various workouts that might be helpful to all runners who are looking for workouts appropriate for their fitness level. When I work on my cardiovascular fitness I try to add a few minutes to my run each time I exercise, to let my body gradually adjust to the increasing length of my runs. Also, interval training is one of my go-to running workouts. Interval training consists of bursts of high intensity running (varying anywhere from 1 minute long to 8 minutes long) followed by a time of active rest (fast walk or slow jog – the length of active rest should be equal to or shorter than the high intensity run). I like interval training because it tends to be more intense during the high intensity rounds and it generally takes less time to achieve the same muscle exhaustion/calorie burn as longer runs. Interval training is also known to increase metabolism a little more than long runs at a steady pace. About.com offers some great interval training workouts on their website. *Instead of running on pavement I recommend running on grass, dirt or another soft surface if possible. This is a preventative method to potentially avoid joint pain, joint inflammation and joint/tendon overuse injuries. otherwise known as stadiums are super challenging to do! I tend to go to Bryan High School’s Viking stadium. I run up one flight of stairs, and jog down the other flight of stairs. What a workout! There are so many variations of workouts that can be done there. For example, run or walk up the stairs, then back down. Next, perform a set of lunges, push ups, and abs and then run up another flight of stairs. Repeat until you complete the whole lap. The same can be done on the track. Simply run or walk a lap or two and then perform a few exercises. Then it’s back to laps, and so on. Also, you could run a lap on the track and then run up and down the stairs, do another lap and another stair run, etc. Now that’s guaranteed to keep your heart rate up and calories burning! Outside of running, strength training is great to do outdoors. Sometimes I like to combine my workouts and do a bit of running and strength training as part of the same workout. Lunges. Lunges target quadriceps, hamstrings and glutes which are most of your upper leg muscles. Here’s an example of what a proper lunge looks like. By using a lot of large muscles in one exercises we end up burning more calories since large muscles require more oxygen and energy to keep us going. 1. Place one foot in front of the other with enough distance to keep your front knee above your ankle. Hold on to a wall or rail and perform stationary lunges (no stepping back and forth into a lunge). When ready, let go of your balance support. 2. Holding onto support with feet together, step forward, perform a lunge and push off with your front leg to step back into your starting position. Let go of the support when ready. 2. Holding onto support if needed, perform walking lunges. After stepping forward and performing a lunge, push off with your back leg to move forward into a starting position. Perform 10-20 repetitions, gradually increasing the number of sets or repetitions. Push ups. This is a great exercise for chest, arms, and shoulders. Here’s an example. Push ups engage a lot of different muscles in addition to upper body (abdominal region, legs, back) thus helping us burn more calories. 1. Place hands on a wall and perform push ups. As the exercise becomes easier to complete, move your hands lower on the wall, then on a lower surface, such as a rail, a bench or a table. 2. Move to the ground and in a plank, drop the knees so that they are supporting your body instead of your feet. 3. 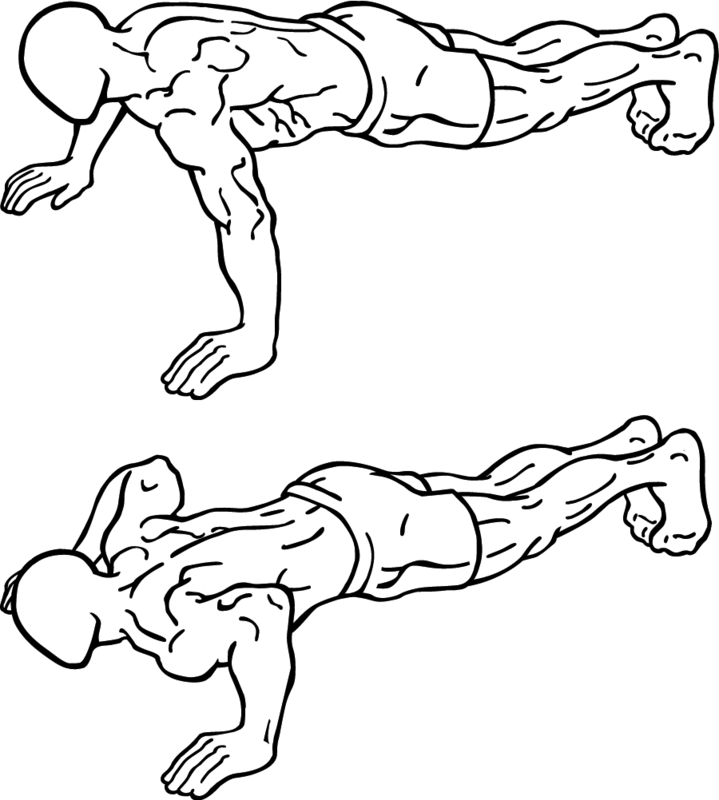 Push up in a plank position with hands and feet as the support. Perform 10-20 repetitions in each set, gradually increasing the number of sets. Abdominal exercises are my third go-to exercise that don’t require any equipment. There are many variations of crunches and I prefer to alter them in each workout. There are many abdominal exercises varying from sit ups, crunches, supine leg lifts, to planking and toe touches. All of which can be done on almost any surface, so get creative! Again, depending on the exercise the number of repetitions in each set could vary from 10 to even 30. There are a few other exercises that I love to do outside. Burpees, sprinting, high knee running, mountain climbers, bridges, jumping jacks, and anything else that keeps my heart rate up and my body moving. Bicycling is another activity I enjoy doing outdoors. I don’t have a special road/mountain bike, I just have a simple cruising bicycle, but when I go on rides I know that my legs are still working as hard as if I had a professional bike (especially when biking up hill). You don’t need an expensive or special bicycle to get the benefits of biking. As long as you are putting effort into riding and feeling sweat running down your back, you’re doing great in terms of getting some exercise (sorry for the visual, but hey! sweating is good for us). Just like when running, I love taking someone else on a biking trip around town. I tend to stay on sidewalks (no one uses them anyway!) but there are some areas in town that have special bicycle designated lanes. You can find those mainly around College Station and especially around campus. A few other ideas I can share, but don’t necessarily do myself, is playing tennis, basketball or throwing a frisbee in a park. It’s important that what we chose to do is also something that we enjoy. There is no better way to work out than doing something that you enjoy. Happy exercising, and hurry up! It won’t stay cool for long!